A round or an oval trampoline may not a good choice if you are planning to purchase a trampoline for practicing gymnastics, multiple back flips or other tricks. 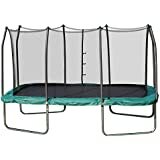 A rectangular trampoline is more spacious and consistent for performing tricky maneuvers and multiple jumps therefore favored by professional gymnasts. Additionally, in a rectangular trampoline the bounce is more consistent and even due to the placement of springs in different parts of the mat surface. The main benefit of the rectangular trampolines is that they have a bigger bounce and are more versatile. The bounce is even on every part of the jump surface. This is because in a rectangular trampoline the springs exert tension at different rates giving you a strong and a powerful initial lift. The springs in a rectangular trampoline work independently and thereby giving more stability, consistency and control on takeoffs and landings. Rectangular trampolines can also accommodate more weight and are best suited for professional use. Rectangular trampolines are preferred by gymnasts, professionals and athletes as they offer a higher bounce and have a greater capacity to absorb force while landing. 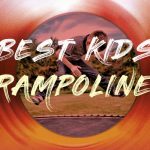 Round or circular trampolines offer lower bounce and are ideal for kids, toddlers, beginners and backyard family recreation. Most trampolines for kids and toddlers are round in shape. The big round trampolines are safer in the sense that the jumper is always directed to the center of the bed. On the other hand, on a rectangular trampoline the professional decides the course of landing. This could be risky if the jumper lacks the required skills and experience. In addition, the spring size in a round trampoline is smaller thereby reducing the risk of injury to children. The springs in a round trampoline exert tension at a same rate and hence provide a softer, slower bounce, which is relatively safer even for multiple jumpers. 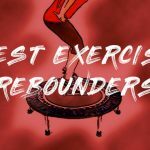 Every bounce on a round trampoline is different so you do not have much control over your bounces. However, in a rectangular trampoline the bounce is more controlled which gives you more balance. Another difference is in the pricing. Rectangle trampolines are priced higher due to their low availability and complexity in design. A rectangular frame design requires more material for it to be strong and stable. Round trampolines need less support due to their intrinsic circular strength, hence low manufacturing costs and low prices. Always consider the space in your yard before buying any trampoline. Rectangular outdoor trampolines usually occupy a larger yard area than round trampolines. You may also opt for square trampolines, as they are more symmetrical and can be placed in corners which saves yard space. 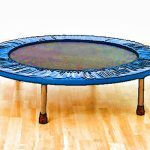 Round trampolines are lighter in comparison to rectangular trampolines and can be moved easily around the yard. Safety net enclosure is available for both round as well as rectangle trampolines. Trampoline safety enclosure is always recommended especially with multiple jumpers to reduce the risk of trampoline injuries. The rectangle Skywalker trampoline is a great option as it provides a good bounce that is even across the trampoline. 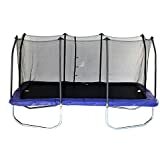 Many families choose this rectangular trampoline as it is preferred by gymnasts. 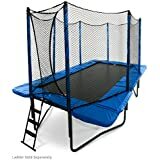 Skywalker trampolines feature a unique patented no gap enclosure system. This unique system attaches the enclosure net to the jumping mat at each and every spring eliminating dangerous gaps. The enclosure net is tightly woven so that the fingers cannot pass through. The poles of the enclosure system are foam padded and angled at the top to ensure sufficient distance between the trampoline net and the poles. The springs of the rectangular trampoline come in two sizes for improved tension and are made of tightly coiled heavy gauge steel, which is galvanized for improved rest resistance. For added safety the springs are placed on the outside of the enclosure net so, the jumpers cannot come in contact with them. Furthermore, the springs are covered with a thick UV resistant vinyl coated spring pad that is secured over both the springs and the frame by numerous stretch bands throughout the frame. The frame of the trampoline is made of an extra thick 12 gauge galvanized steel for extremely strong rest resistance build. Welded T-Sockets at each trampoline leg and enclosure joint increase the stability of the trampoline and prevent structural twisting. Additionally the sockets provide for easy and sturdy installation of the enclosure balls. The enclosure net entry is equipped with a dual closure system featuring a heavy-duty zipper and positive latch clips for added security. The jumping area measures around 6.5 x 12.5 ft. The height of the trampoline mat from the ground is around 4 ft. According to the instructions, the entry door should be installed in the center of the long side. The poles are covered with a thin layer of foam. There are no locks on the entrance to prevent kids from entering unsupervised. 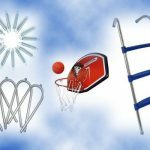 The trampoline ladder accessory needs to be bought separately. Users have reported that this trampoline is more bouncy when compared to the round ones. The specified weight limit is around 200 pounds but many users weighing 250 pounds reported good feedback. One user weighing 300 pounds reported that the trampoline springs are not quite strong to support his weight and flips are not recommended for people over 200 pounds. The trampoline takes around 2 to 3 hours to assemble with easy to follow step-by-step instructions. The safety net is about 6 feet high. The trampoline ships in two boxes. Although higher priced, the ACON Air rectangular trampoline is one of the best in the market. It can be used all year round as it is weather resistant and can survive frosty conditions. The trampoline has heavy galvanized 138 gauge springs with a length of 10 inches. The heavy-duty 2.4-inch galvanized frame has 0.1 inch thick pipe walls. With its solid construction and a sturdy frame, there are no single user weight restrictions for this trampoline. ACON Air 16×9 trampoline has a large rectangular design making it an ideal choice for competitive jumping. 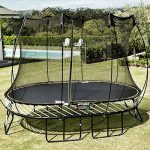 The trampoline comes with a removable safety enclosure net and the company offers a five-year warranty on the frame. The jumping mat is UV protected with polypropylene treatment. Spring puller tool is provided to help in installation. The jumping area measures around 14 x 7 ft.
No weight limit specified for single user. Some owners have reported that it easily manages 500 pounds with multiple kids lightly jumping. The trampoline weighs around 500 pounds. The installation takes around 3 to 4 hours. Users reported very high quality bounces with this trampoline. The ground clearance is quite high. Buyers were extremely satisfied with the customer service. This trampoline has 100% positive reviews. The build quality is excellent as the product is designed in Finland. 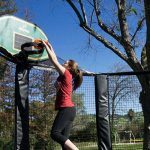 This rectangular trampoline from JumpSport comes with patented StagedBounce technology. Due to this technology, you will experience less stress on your joints as only half the total number of springs engage upon impact while the other half engage split seconds later. This leads to a higher jumps and ensures more control over the bounce. It also helps reduce the risk of chronic injuries. 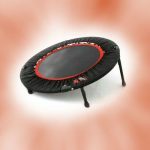 JumpSport StagedBounce trampoline also offers a larger jump area with a reduced footprint. As with other JumpSport trampolines, this trampoline also includes safety features such as flexible padded poles, UV resistant net, patented overlap entry door, extra thick padding, cold rolled galvanized steel, triple fail-safe enclosure, etc. This makes it one of the safest trampolines in the market with the highest number of safety features. The jumping surface measures around 7 x 14 ft.
Enclosure net is around 6.5 ft high. The weight limit is around 230 pounds for a single user. Installation takes around 2 to 3 hours. However, the safety net installation is a little complex.